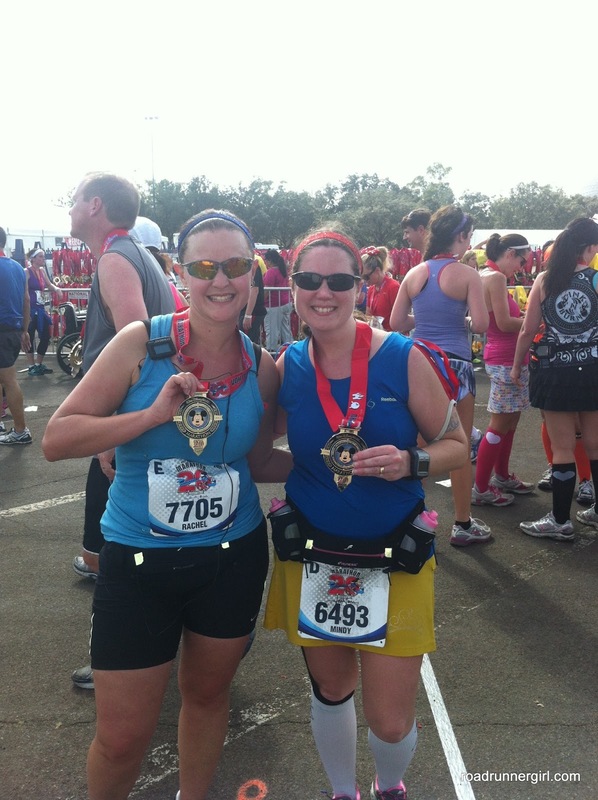 Road Runner Girl: Walt Disney World Marathon 2013 Part 2! 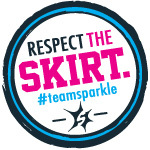 Don't forget to read Part 1 of my recap! 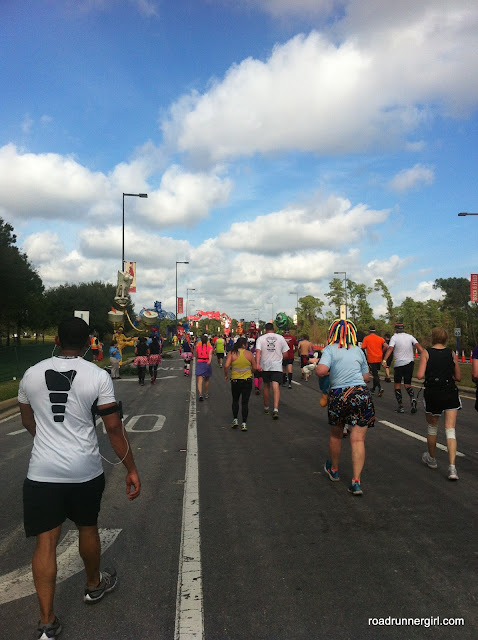 We left Animal Kingdom around the 13 mile mark. 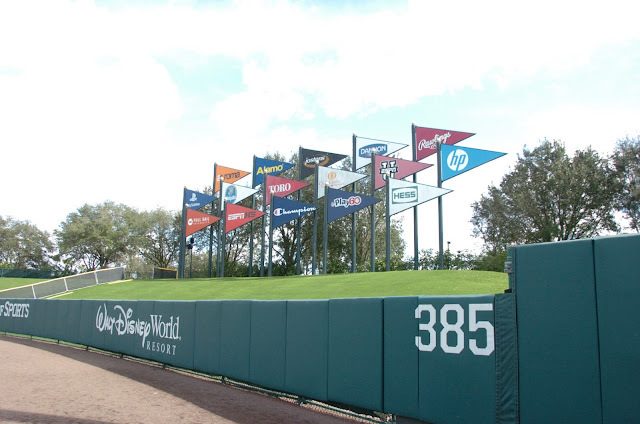 And so began another long stretch until we reached the ESPN Wide World of Sports. We were basically running on the highway...the sun was beating down and there was absolutely no shade. Miserable! There were a few character stops along the way that we stopped for. I couldn't pass up Pluto and Mickey! And let's not forget the gravediggers! Yes there were actual gravediggers and tombstones! I decided to play dead...but I couldn't stop laughing! One of the gravediggers came up to Rachel and me and asked if we felt dead yet. We told him no and he said, "Good. I don't feel like working today." Hilarious!!! And a nice break from knowing we still had about 12 more miles to go! 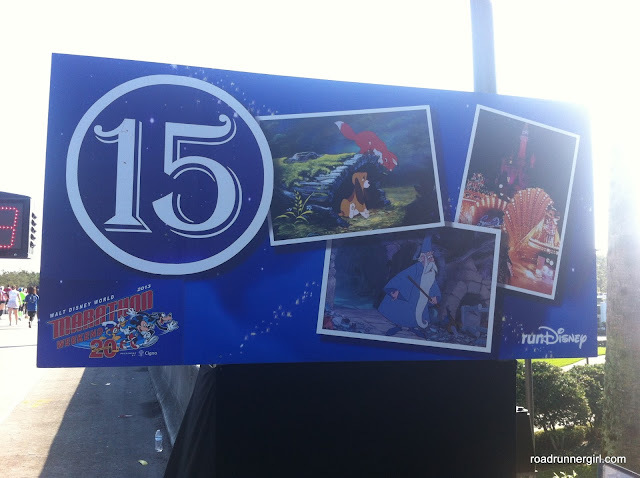 Finally we saw the 15 mile sign! Yay! 11.2 miles to go!!! And then who did we see? 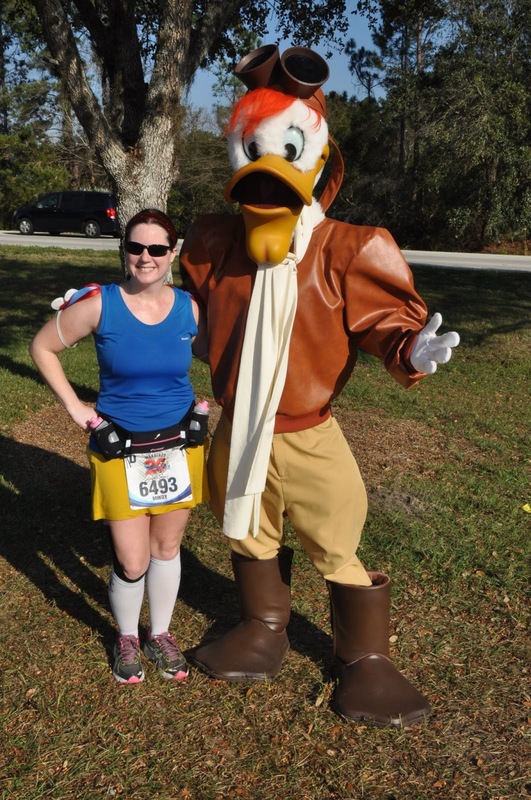 Launchpad McQuack!!! I haven't seen this character in forever! My boys don't even know who he is! I had to take a picture with him! 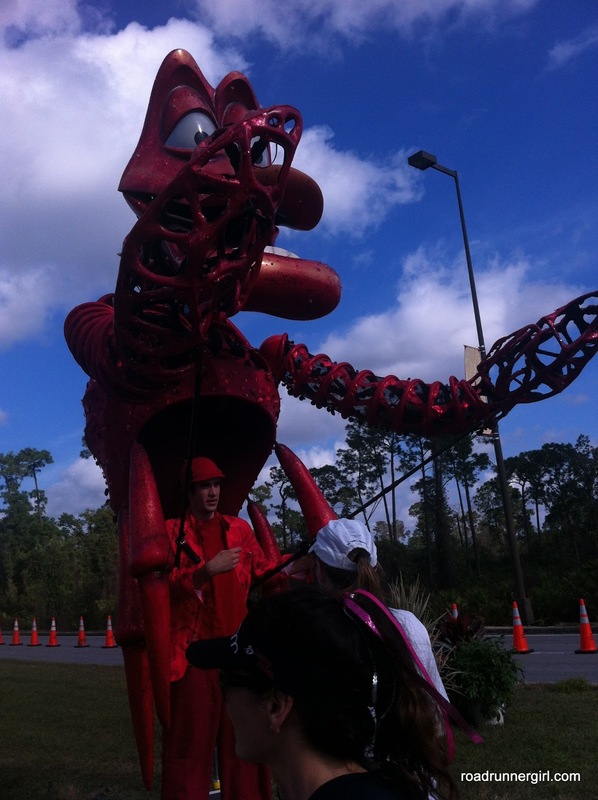 Around mile 17 we entered the ESPN Wide World of Sports. And right when we entered they had the absolute BEST thing ever...a sponge station!!! They handed us cold, wet sponges! It was amazing!!! I dripped it all over my face and the back of my neck! I don't think anything has ever felt so good lol! 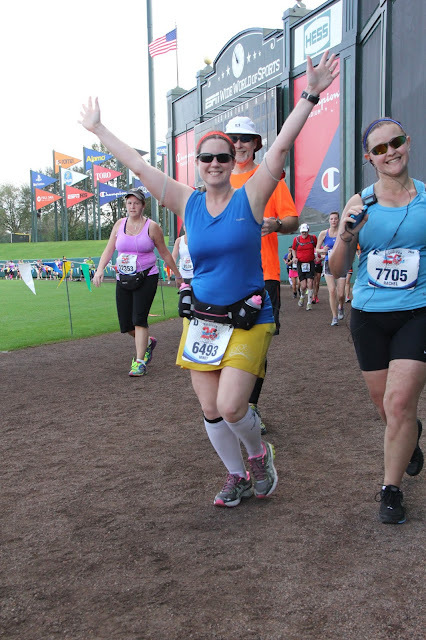 We ran around the perimeter of a couple of soccer fields. We ran a lap around the track...changing from concrete to the spongy track was fabulous! 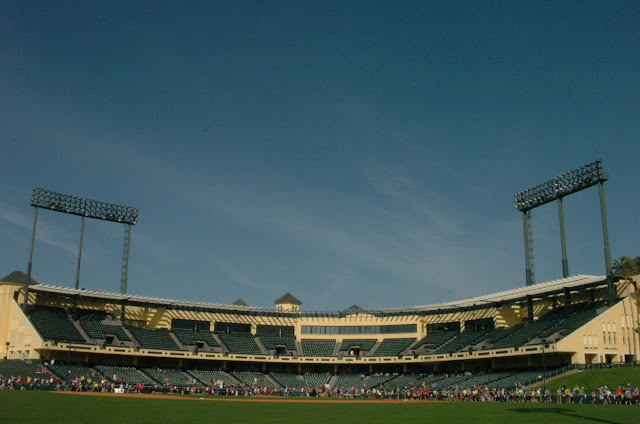 Then we finally made it out onto the baseball field where the Atlanta Braves hold their spring training! They had video of us running up on the jumbo tron...it was so awesome!!! Well....I'm not sure if maybe my expectations were too high or what but it wasn't that spectacular in my opinion. They had neat puppets (I guess that's what you call them) and a photo opportunity with Mickey, Minnie, and Pluto. 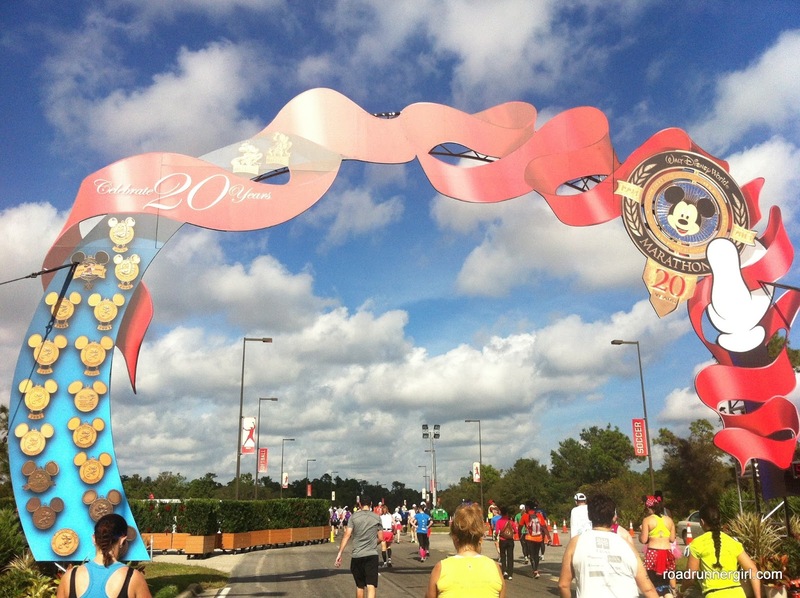 And there was a pretty awesome arch that showcased all 20 medals from the marathon...that was pretty neat! As we were headed towards Hollywood Studios I knew this was it. Only 6.2 miles to go. 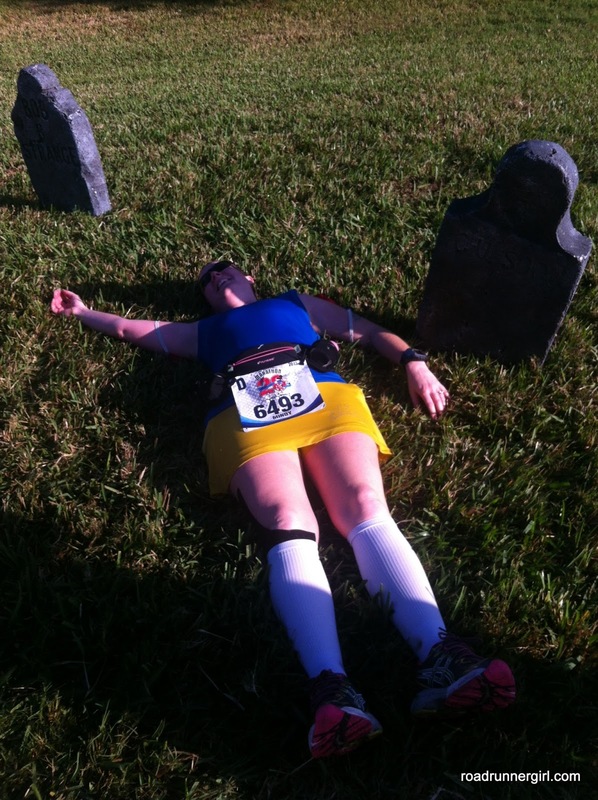 I knew this would be the hardest part of the race both mentally and physically. Everything was screaming at me to stop....my head and my entire body. But my heart wouldn't let me stop. I was almost there! Rachel and I were taking a lot longer on our walk breaks. 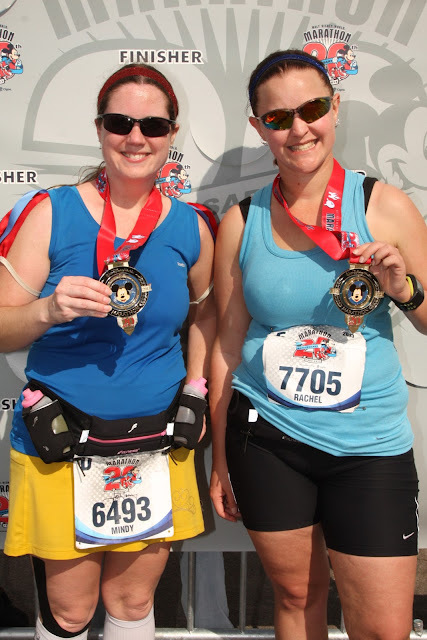 Not only were we tired but the sun and heat beating down on us was taking its toll. Finally we reached mile 22 and entered Hollywood Studios. And guess what we found there? CHOCOLATE!!! 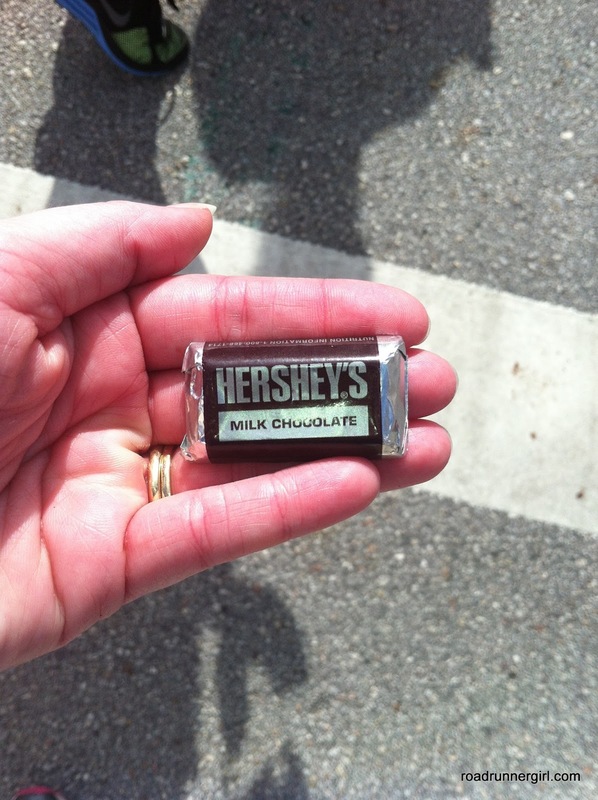 They had wonderful volunteers handing us chocolate!!! Yum! We ran down the Streets of America, made it to the hat, and then down Hollywood Blvd. 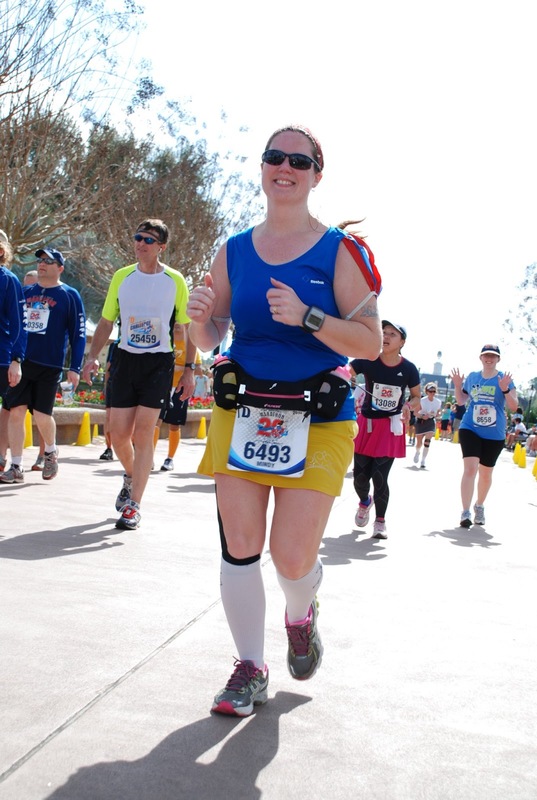 And these are some of my favorite pictures of me running! 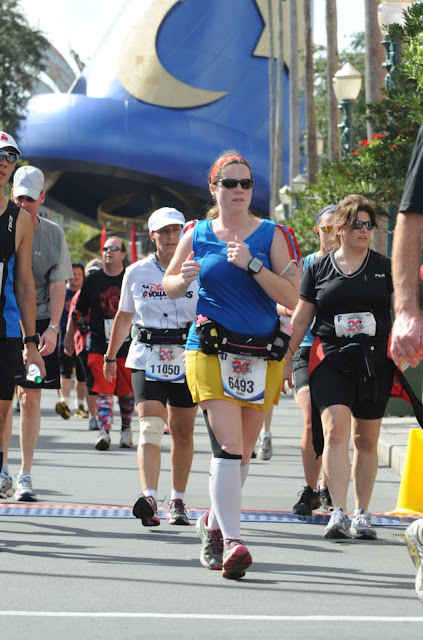 See the look of determination on my face? I was trying to enjoy running through the park but I was also ready to see that finish line! 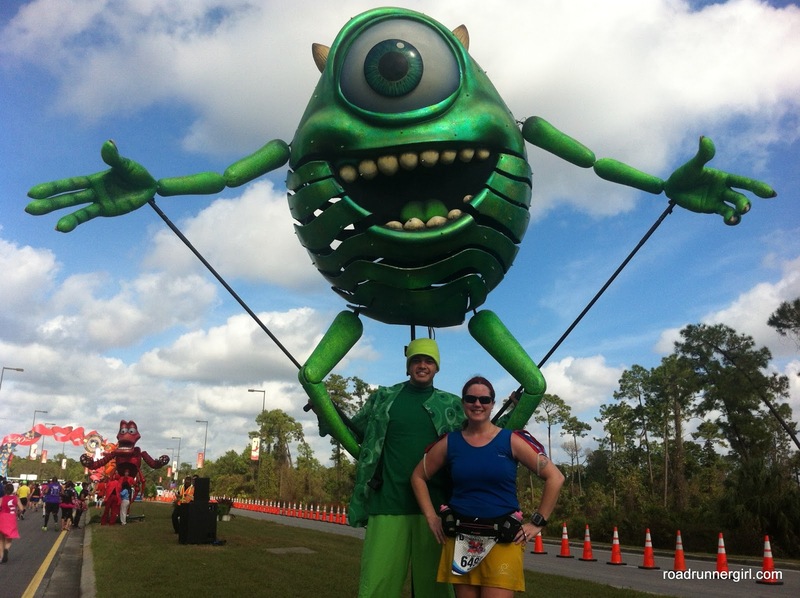 We exited Hollywood Studios around mile 24 and we were on our way to Epcot...our last park! 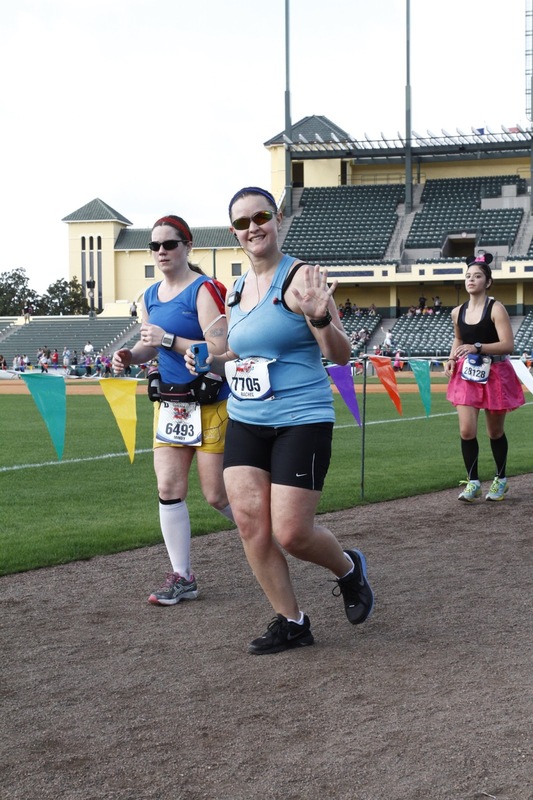 We started running toward the Boardwalk and passed the Yacht and Beach Club. I loved this part of the route because I've never been lucky enough to stay in these resorts. And I've never been to the Boardwalk either. So it was awesome seeing new scenery! And it was sooo quaint and beautiful! 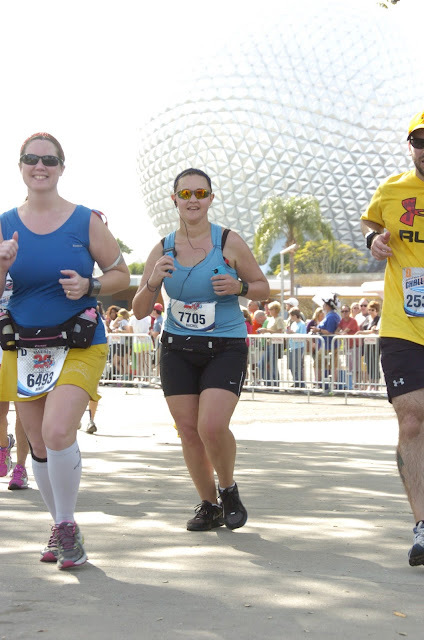 We finally entered Epcot and I knew we just had to run around the World Showcase and past Spaceship Earth and the finish line would be there. We only had a little over a mile to go!!!! I'm not sure which country we were running in at the time but all of a sudden I heard Rachel scream and run over to the side. Her boyfriend had surprised her by waiting for her in his favorite country! It was awesome seeing their reunion! He snapped a few pictures of us (which are some of my favorite...thanks so much Rachel!) and we were on our way. 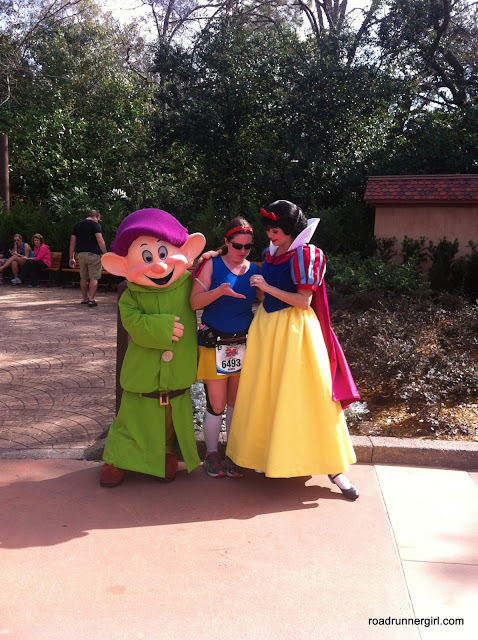 We had almost made it around the World Showcase and I looked to the side and saw Snow White and Dopey!!! I was so excited! I thought I wasn't going to see her. It was the one picture I really wanted since I was dressed like her! When I walked up to her she gave me a look that told me she was flattered I'd dressed like her! Then she asked me to do my hand a certain way and I had no idea what she was talking about! Finally the photographer told me to make a heart with our hands and then I got it! 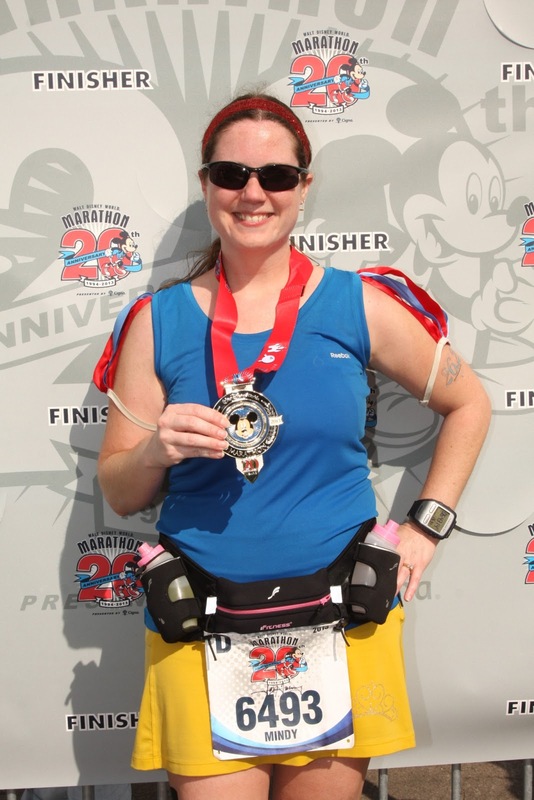 I apologized and said I'd been running for way too long and had no brain power left lol! It was pretty comical....and I felt like an idiot lol! 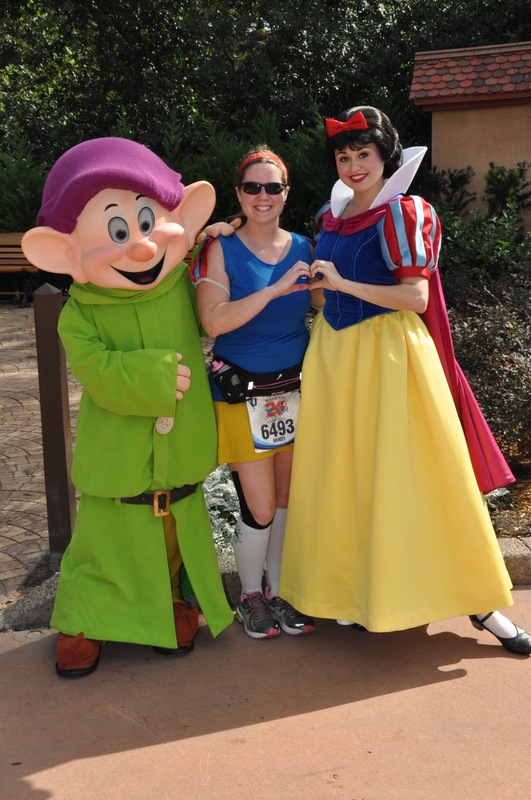 But I was so excited I got my picture with Snow White!!! Finally we saw Spaceship Earth and I knew we were close to the finish line! 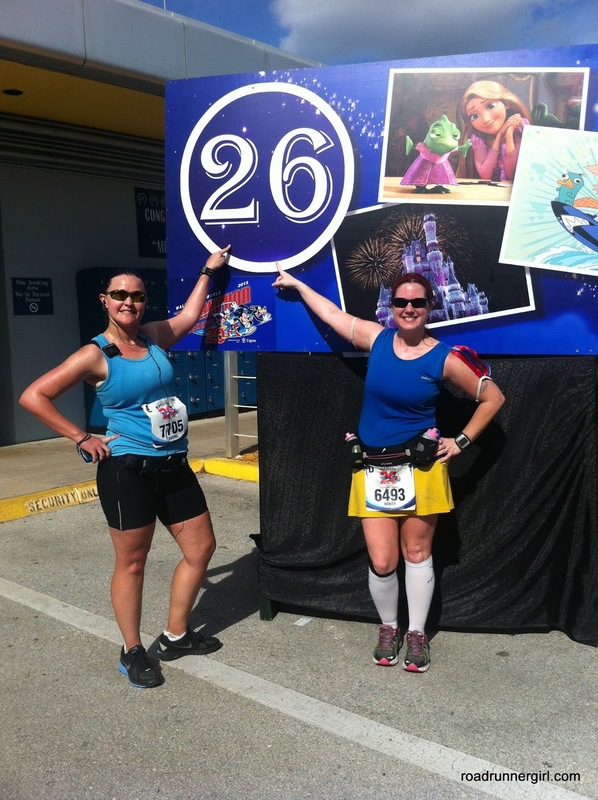 And then we saw it....the 26 mile sign!!!! It was soooo good seeing that sign!!! We took a quick picture and then we were on our way! That finish line was ours and we couldn't wait to see it!!! And there it was!!! I started getting real emotional at this time! We did it!!! 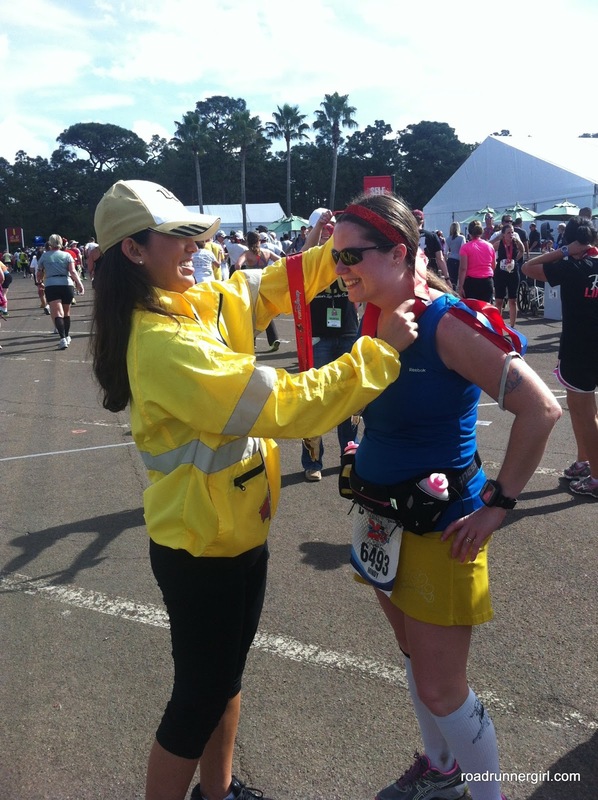 Rachel was a marathoner!!! I was soooo proud of her!!! 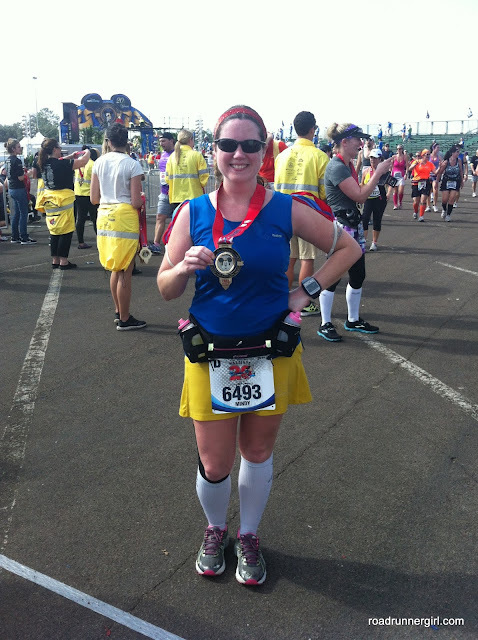 And I had finished my second marathon!!! I grabbed Rachel's hand and we crossed the finish line together!!! It was the best feeling ever!!! We stopped running and hugged each other! I'm not sure if Rachel was but I was crying! We started walking and saw the medals! That beloved bling was finally mine!!! 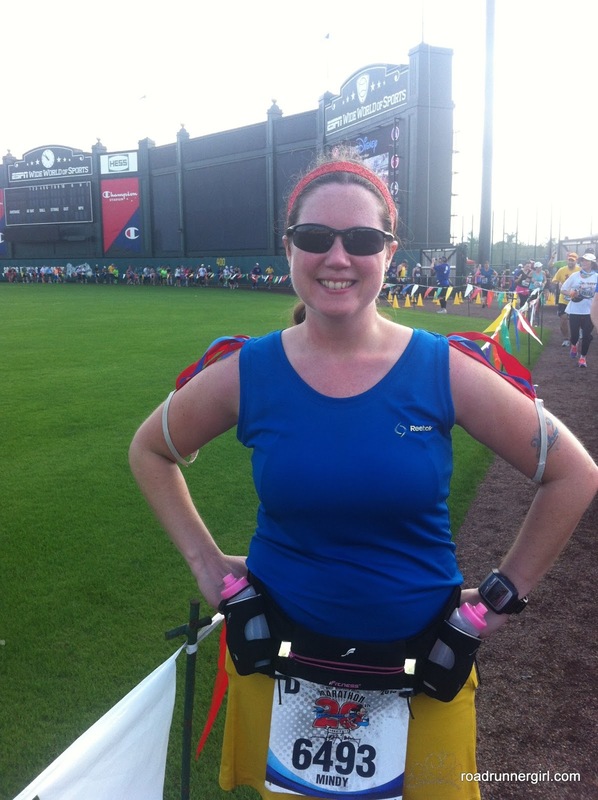 My official time was 6:43:09...an hour and 15 minutes slower than my first marathon! 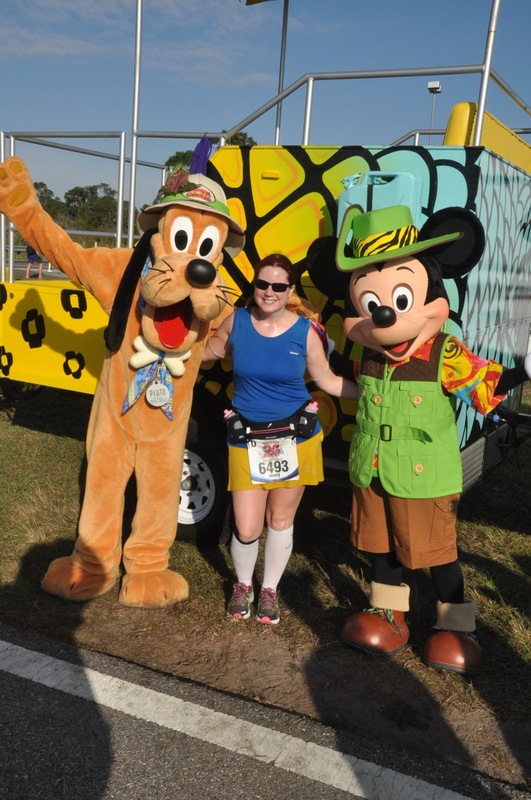 But my first marathon wasn't a Disney race...so there were no stops for pictures. And the weather wasn't hot and humid. It may not have been the time I wanted...but who cares? I am now a second-time marathoner!!! - This race was what I expected of a runDisney event: super organized, tons of water stops and food stops (there were at least 2 stops that I remember that had bananas), and the volunteers and cast members were amazing! They were always calling you by name (or in my case calling me Snow White) and telling you what a great job you were doing! 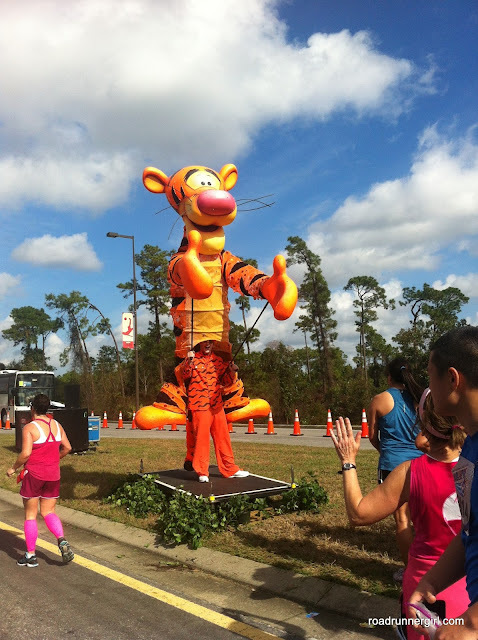 - Having character stops and entertainment along the route was so much fun! 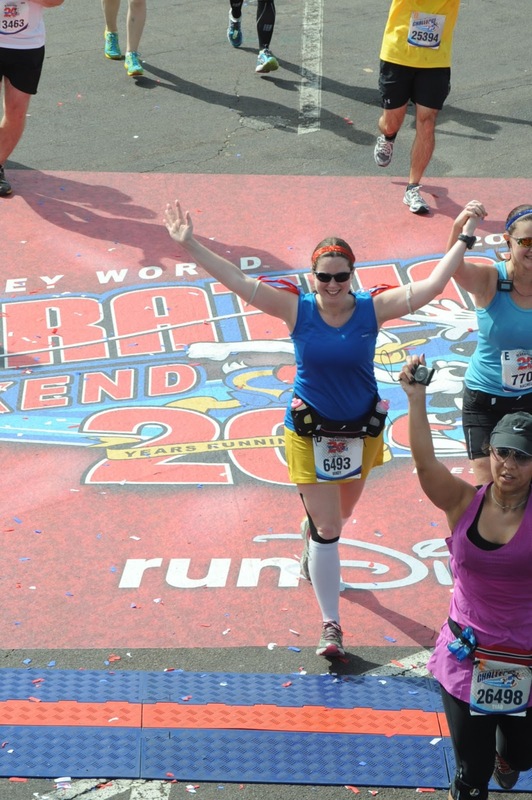 And of course running through the parks was unforgettable! - I HIGHLY recommend any Disney race! It is truly a magical experience!!! I questioned why I encountered a knee injury during this training. I wondered and asked God why it was happening to me. 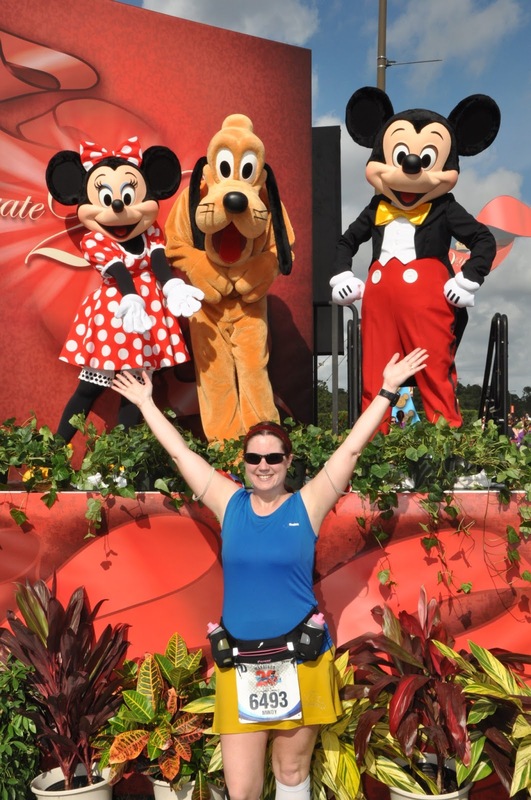 I loved running Disney races and just wanted to run pain free. Why was I getting injured now? I believe that God has a plan for us that we may not always understand. I KNOW now why God allowed my knee injury. I believe He wanted me to slow down and take it easy during this race because he wanted me to meet Rachel. 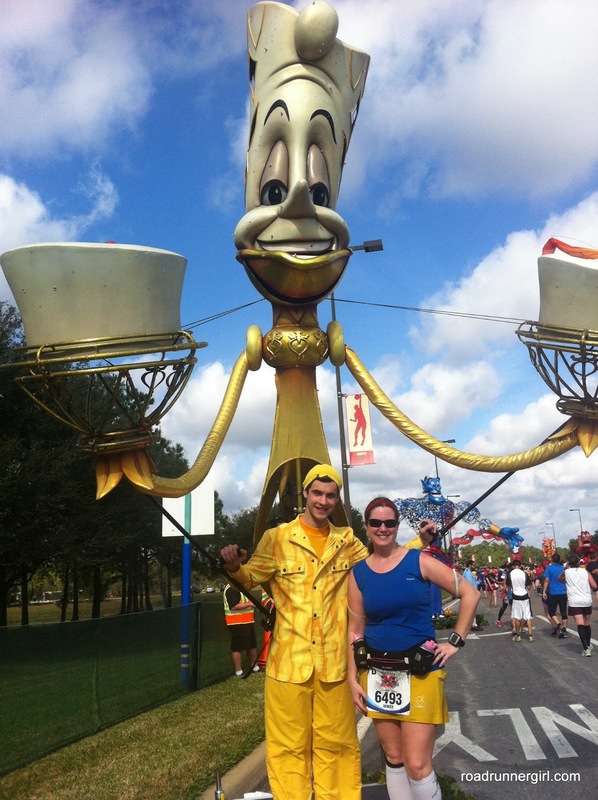 He wanted me to help her and encourage her through her first marathon. How do I know this? Because normally I run for me. If I'm feeling good then I just run. I usually don't wait for anyone. 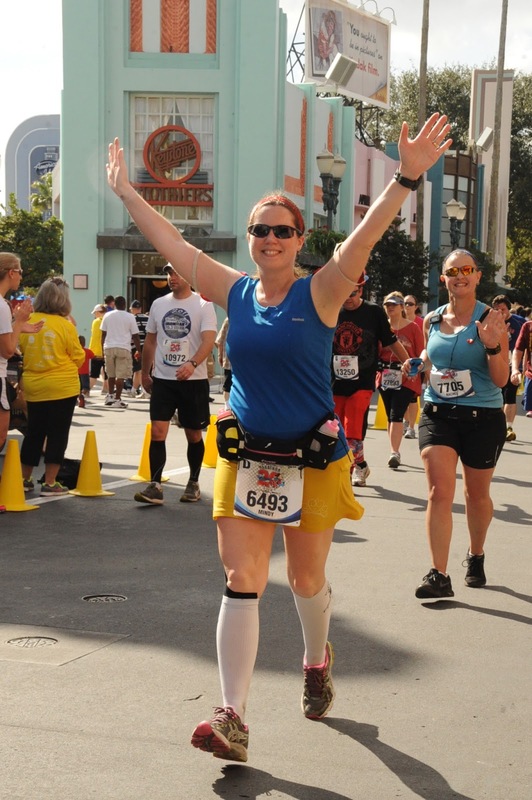 I felt great during this marathon other than the normal tiredness. But something just wouldn't let me leave Rachel. I just couldn't leave her. And that's not like me. 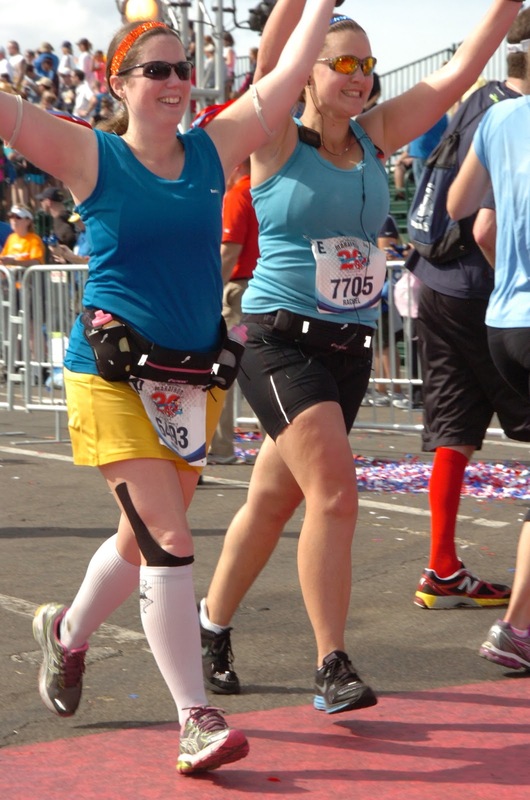 Crossing that finish line and seeing her face was truly unforgettable and an experience I will never forget! 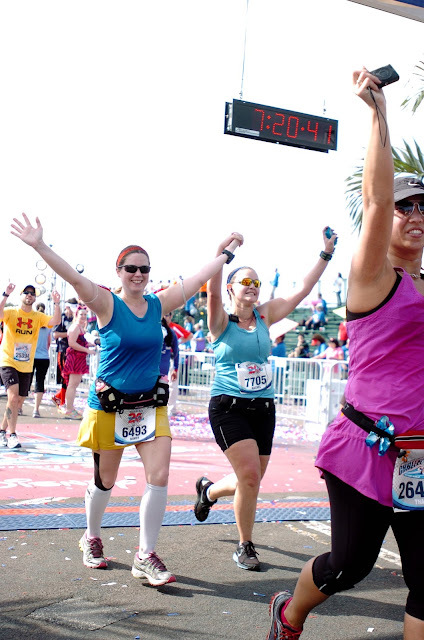 QOTD: Have you ever run a Disney race? 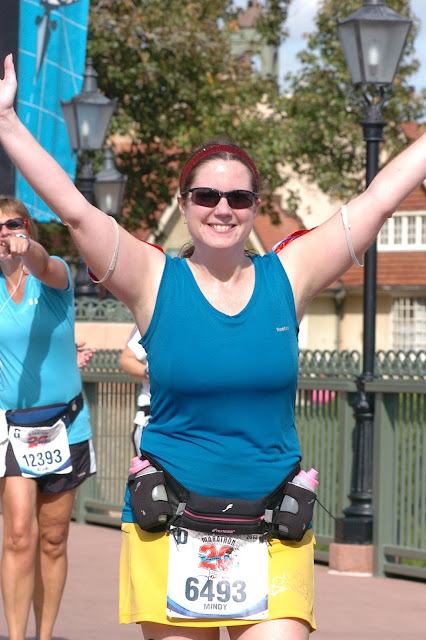 What is your favorite thing about Disney races?